Rolls-Royce is joining forces with Derby based Porterbrook, the largest owner of passenger trains in the UK, to launch the first hybrid rail project in the country. Porterbrook owns more than 30 per cent of the UK rail fleet and invests in UK rail, both in purchasing new trains and other equipment as well as improving assets for use on the network. 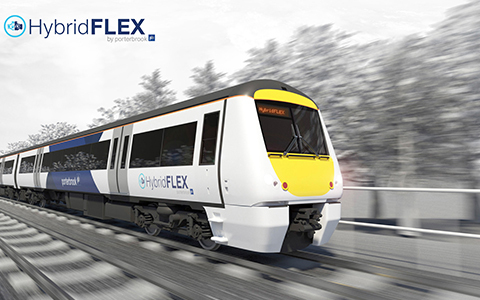 Rolls-Royce and Porterbook have agreed the delivery of MTU Hybrid PowerPacks that can convert Class 168 and Class 170 ‘Turbostar’ DMUs from diesel-only to hybrid-electric operation. The letter of intent, which was signed at rail industry trade show Innotrans, covers the delivery of hybrid systems for installation on two test trains. Following trials, Porterbrook aims to offer hybrid conversion to a range of customers operating existing Turbostar fleets. The announcement comes after Derby-headquartered Porterbrook's profits jumped to nearly £90m during its latest financial year. Mary Grant, Chief Executive of Porterbrook said: "Porterbrook is committed to reducing the emissions and carbon footprint of our existing diesel powered fleets. "We hope our investment in this trial of MTU Hybrid PowerPacks will enable us to offer wider fleet fitment of this technology, so that our customers can reduce both emissions and operating costs, as well as improve air-quality along urban corridors. "Hybrid trains have the added benefit of operating with very little sound when using battery power, offering additional benefits to the railway’s near neighbours. "This is one of several initiatives that Porterbrook is undertaking to address the challenge, set by rail minister Jo Johnson MP, of removing diesel-only trains from the UK rail network by 2040." Warren East, Rolls-Royce Chief Executive said: "We are pleased to be helping to write a new chapter of environmentally friendly, quieter and more efficient rail travel in the UK. "With the innovative MTU Hybrid PowerPacks, Rolls-Royce and our partner Porterbrook will be setting new standards on the UK network; helping to reduce emissions, increase fuel efficiency and improve the lives of people who live near train stations." The trains will be built at Bondholder Bombardier's Derby site and are expected to be delivered in 2021.